Hello folks. I hope you kind folk will let me write random drivel on here. 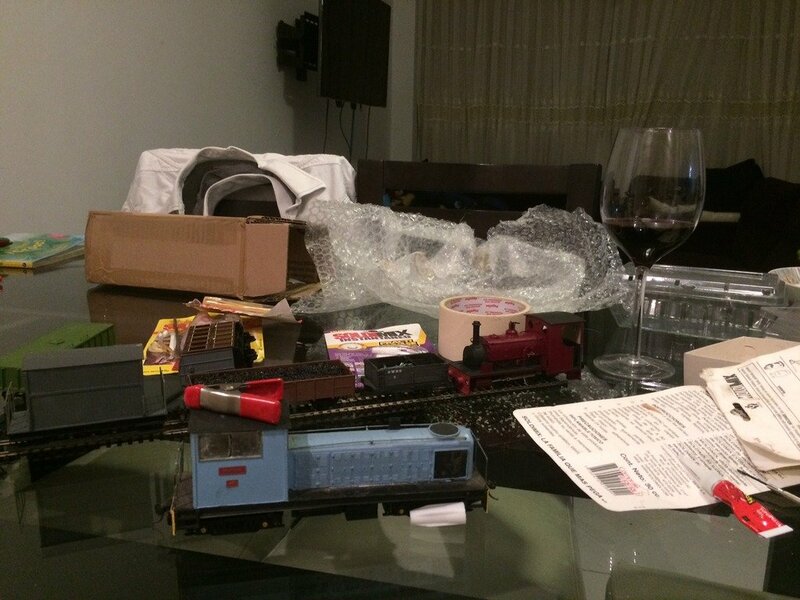 as although I'm planning 00 gauge, it will actually be O scale.. That's right, I'm planning O-16.5 narrow gauge, outside, in Peru. Things are currently very much in the planning stage. 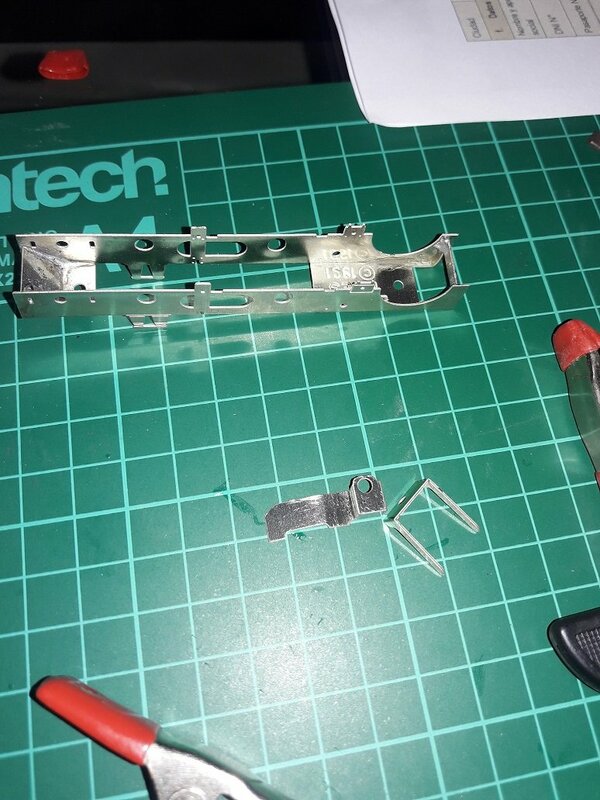 I've hoovered up quite a lot of Peco code 100 nickel silver flexi track, and a little bit of rolling stock. Most importantly of all, I have planning permission and the interest of my daughter (the main reason for the planning permission!). As we live in an apartment, we have no garden What we do have is a terrace, with a nice wall around it. The current plan is an end-to-end layout, maybe with a return loop at one end (that is subject to planning permission), around 4' off the floor. We will be starting with a hinge-up baseboard of approx 2'x5', which will have a station área and some scenery. This will be on an area of the terrace which has a plastic roof, shielding it from the worst of the UV. The single line track will leave here, crossing over a removable bridge (for access to the laundry room), running along some 2"x4" or similar, before another removal bridge (another door), and curving to the left to pass under the hot wáter heater and in front of the sink (probably removable section again), before snaking up against the wall, in time for a sweeping left hand curve to the next wall, with a long 10' ish run (I imagine another station área or similar). Then, subject to permission, a return loop around the spiral staircase which goes up to the 4th floor - this would need another removable section for access to the stairs though. Cost of getting things over here is a big limiting factor, so everything will be slow, and geared toward cheap solutions, so please be patient, and with 2 young children even slower... I hope to get back to blighty next year for some hols, so I'll be hoovering up bargains to bring back with me! Sure, no problem with writing about an 0-16.5 narrow gauge line - in fact I would be most interested to follow the development of your layout. I'm not familiar with narrow gauge layouts although I have seen examples before in various videos and magazine articles. Usually the ones I've seen have been of a 'Continental' appearance but it seems that there's a growing trend for UK themed stock. What are your plans regarding any specific area or region for modelling? Don't worry about the project taking some time - we're quite patient on here as you've probably become aware already. If I remember correctly, I've been at it for about 5 years now but I'm a very slow worker and I would expect you to be up and running well before that. 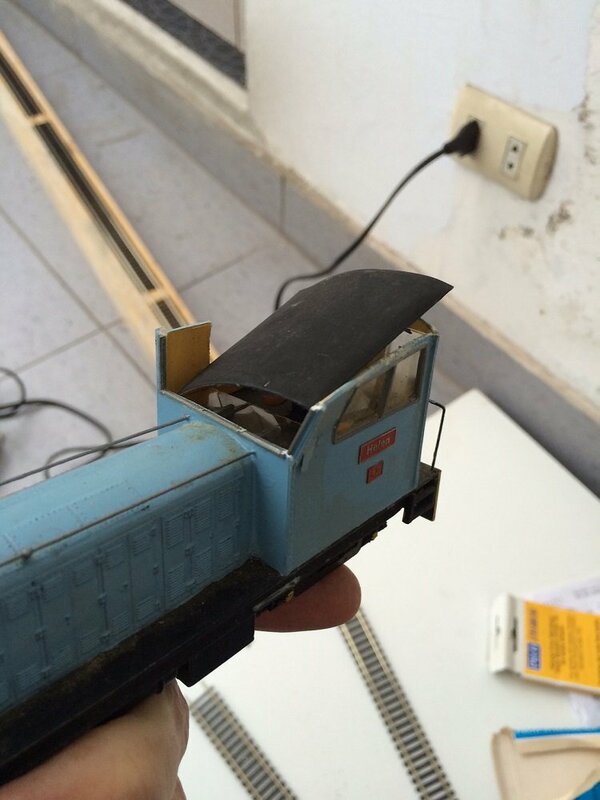 If you get the chance post some photos of the stock you've already acquired and the proposed location for the layout to give us an idea of what you're working with. And keep us up to date with your progress. 1x Freelance diésel, based on a chassis I've never heard of, bogie chassis, mid mounted motor with driveshafts to each bogie, which needs some work. I'll try and get some photos loaded up later. I've seen a few chaps designs for printing onto card for cheap O-16.5 rolling stock, 4 wheel wagons and coaches and the like, so I will probably be giving that a try too. I have thought a couple of times of switching to 00/4mm (cost and availability), but I quite fancied a narrow gauge line, so we will see how it goes. ...I have thought a couple of times of switching to 00/4mm (cost and availability), but I quite fancied a narrow gauge line, so we will see how it goes. Yes, I'd certainly go ahead with the narrow gauge line, especially as you already have some stock to begin with. Narrow gauge gives you the freedom to be more creative and you don't feel there are any strict guidelines you need to follow in order to be authentic. You can adapt items of stock and even have a go at building your own. You can paint them whatever colour you like. I do like to see the UK railway scene in model form with multiple track running and long block trains but I'm quite attracted to the solitary feel of a single line - which is why I decided that my current outdoor line would follow that course. I Love seeing the narrow gauge. Curious to see some more track go don on the layout. Me too! The next step is a trip to the hardware store and get some hinges and other paraphernalia, and get that baseboard up on the wall. Progress is slow with 2 kids, and working Monday - Saturday. Fingers crossed after work Saturday I can get something done.. So, here we are a good 9 months later with very little progress. I did manage to get to the hardware store and buy those hinges, but that was about as far things got, as late January it was confirmed that my daughter needed a second operation ASAP (she has suffered an as-yet undiagnosed condition which has caused her to lose her hearing), so that took care of February and most of March, and since then most spare time has been spent with her therapy. However, our trip to the UK in July at least yielded some dividends - various points, a bit more flexi track, another Hornby 040 conversión, a Hornby Bill (with the better mechanism), and yet another Smokey Joe (my father seems to have a huge stock of Hornby 0-4-0s!). Even more importantly, a decent cutting mat and some stocks of plasticard. Finally, a chance for my daughter to see my father's temporary 00 layout in action (big oval with 4 lines), plus the temporary SM32 layout in the garden, and for the grand finale a trip on the West Somerset Railway so the kids can see (and ride on) real trains (rather scarse in Peru), and finally after her operations, my daughter could HEAR a steam whistle. That was quite emotional to see her reaction. In a slight change, planning permission for the station section under the roofed section of the terrace was revoked ("I didn't realise it would be THAT big"), however permission for the main station área was granted next to the sink, which is actually a good 7 feet wide, so it will mean a bit more space to play. I'm still doodling plans, but probably station area there, with 2 lines leaving toward the spiral staircase, one at a higher level, aiming for a mini Dduallt-spiral type arrangement around the spiral staircase. From the other end of the station a single line will leave out over the original planned route, with 3 removal bridges (I've found the aluminium section used for drywall construction here seems perfect for these with just a small amount of work), finishing in a small terminus plus run around loop. Let's see what the next 12 months bring! Sometimes it goes slowly with train obsessiveness. I have had a couple years of too many other things interfering myself. I am glad to hear that your daughter is having some good results with her hearing. Once again I haven't advanced very much (those hinges are still in their packet! ), however we do have some new rolling stock. 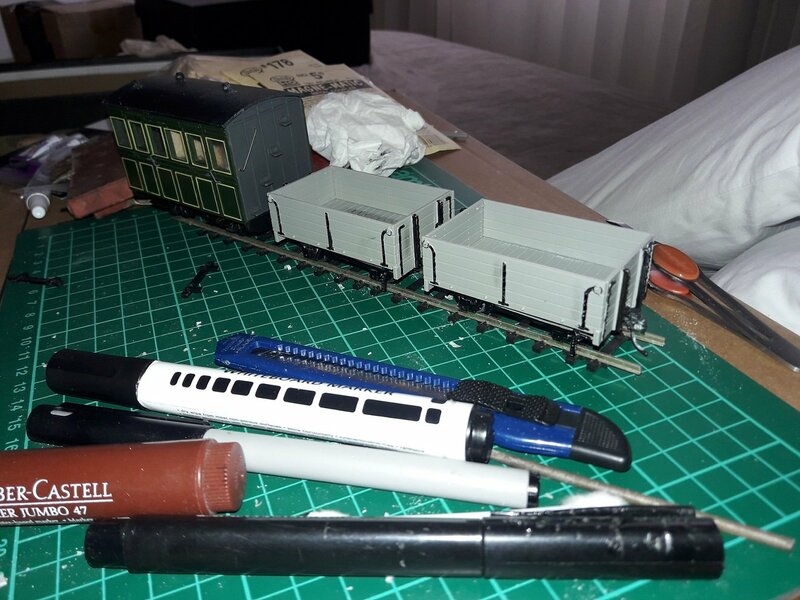 I was bed-ridden for a day after a minor op a while back, and knocked up 2 wagons from kits, first kits I've built in 20 years, and it was rather satisfying. 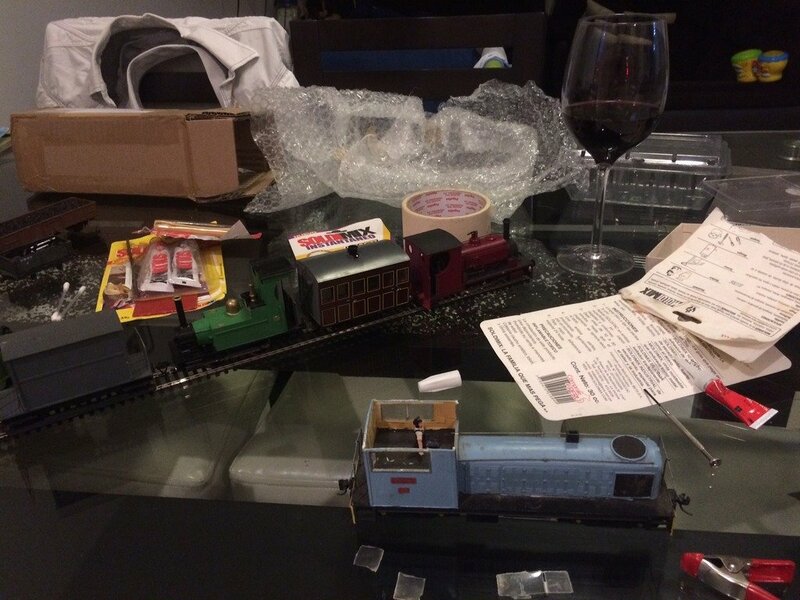 Next up was starting work on my 40th birthday present from my brother - a Peco Fletcher Jennings (Talyllyn) and Branchlines chassis, unfortunately I haven't progressed too much, but I was quite please with my first attempt at soldering up a chassis. 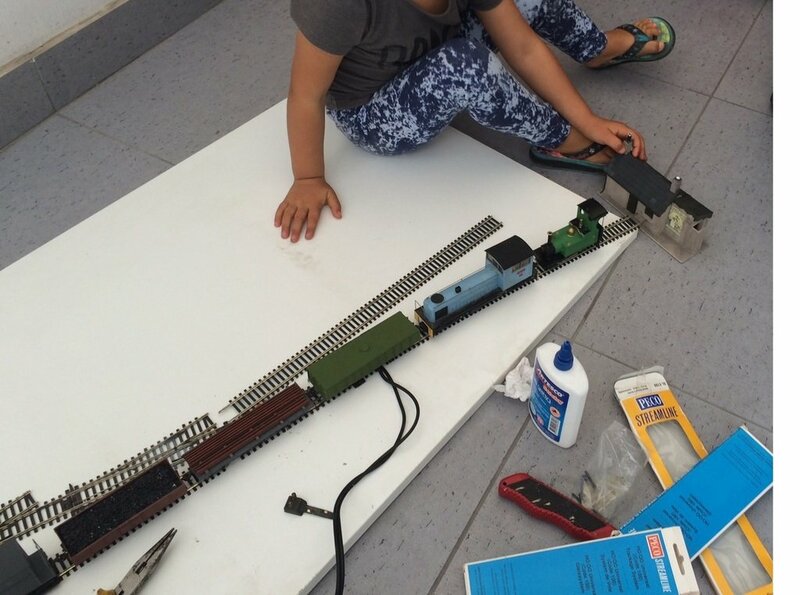 I did manage to pop some track down on the floor on the terrace with some Hornby 0-4-0s again to have some play time with my son the other weekend which was nice, to try and keep his interest - mission accomplished! I'm hopeful (as always), of actually getting somewhere with the track this year - I mounted the batten to the wall where the main baseboard will hinge, this I got done about 6 months ago to see how it stands up to the weather, I'm using some sort of wooden beams for construction, which I've doused in marine varnish. It's been out in the tail end of winter, and all summer, and no degradation visible so far, so I reckon we'll give it a go with that... Hopefully next time I'll have some photos of track outside!